Peter Thomas Roth as a brand seems to be getting a lot of love out in the blogosphere at the moment mainly due to the face masks (which I haven’t tried….yet!) 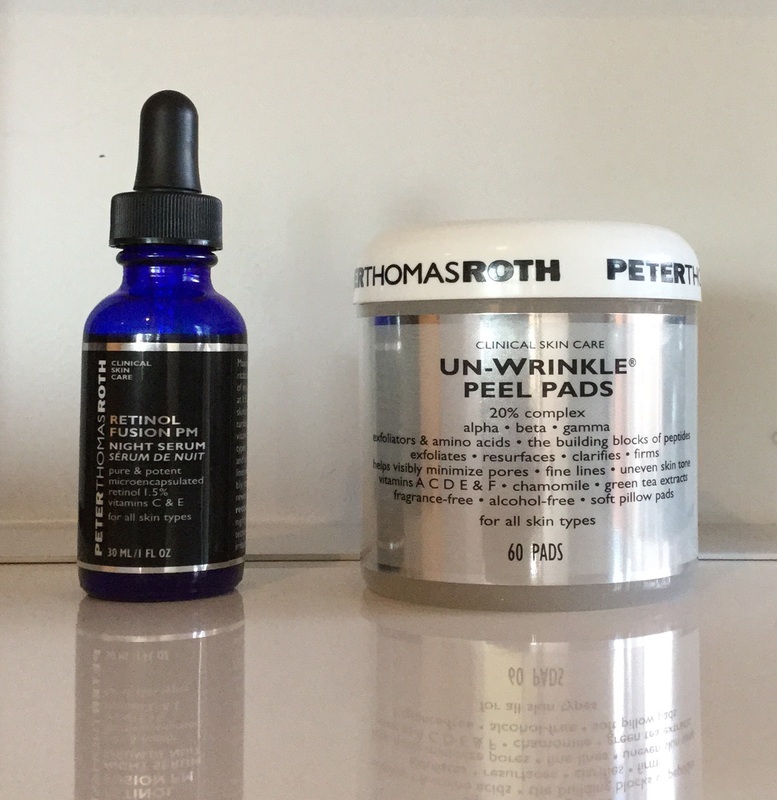 so today I thought I’d talk about two Peter Thomas Roth products – the Un-Wrinkle Peel Pads & Retinol Fusion PM – that I have been using that don’t seem to be getting quite the amount of love that I think is deserving of them. The Peter Thomas Roth Un-Wrinkle Peel Pads come in a tub of 60 pre-soaked pads and is marketed as a daily peel treatment (depending on your skin condition – like if you have dry skin it’s directed to start with use only 1-2 times per week and build to 4-5 times per week whereas oily skin it’s directed to start with daily use and move to twice daily). The Peel Pads claim to exfoliate, resurface, clarify, firm, visibly minimise pores, fine lines and even out skin tone. That’s a whole lot of claims! I feel the name is a little misleading in that at first glance one might only think these are targeted towards mature skins. But I truly believe if you are having problems with blemishes/hormonal acne these pads are brilliant! My experience over the past few months with these pads has been wholly positive and I will say I have experienced improvement in all the areas Peter Thomas Roth claims to improve. My skin feels smoothed and clear when I use these pads regularly. I mainly choose to use the pads in the AM after cleansing. 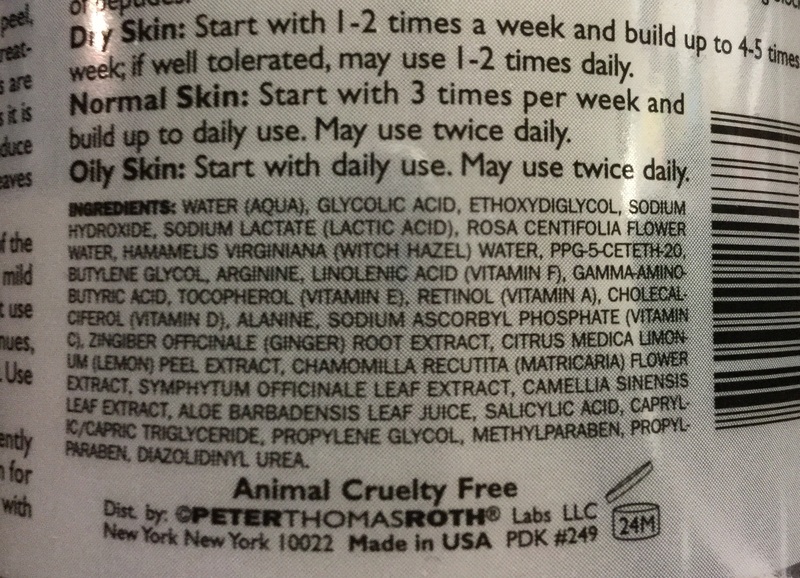 The instructions say to swipe on and leave on for between 60 seconds and 3 minutes then rinse off but I usually leave until I feel the product has dried down and then liberally spritz my face with a hydrating spray and sort of massage around/pat face and leave to dry again before applying my serum. I think it’s also important to note that the pads are fragrance free and alcohol free if the inclusion of those ingredients irritate your skin. I have included a pic of the ingredients list below. If the PTR Un-Wrinkle Peel Pads are my morning treatment of choice then the Peter Thomas Roth Retinol Infusion PM is most certainly my night-time one. Since first getting into retinol treatments at the beginning of the year I’ve tried a few and I think this one is likely the most effective. The PTR Retinol Infusion PM contains 1.5% retinol as well as Vitamins C & E and claims maximum results in the skins renewal process. The dropper dispenses a clear fragrance free liquid – very similar consistency to water – which I then pat into my face quickly. The liquid is absorbed almost instantaneously with no residue left between. A little of this really does go a long way. The first few times I used it I did experience some redness and dryness, which really is to be expected with a retinol treatment but I found rather than using it nightly if I used it only 2-4 times per week and followed up with a hydrating serum & moisturiser the drying effects were no longer. Retinols are known for long term results rather than quick fixes but using this treatment over the past couple months I really have seen improvements and also no further lines cropping up on my face. Insert jazz hands emoji’s here! I’d really love to know if any of you guys have tried any PTR products and how you rate them? So far I have only tried 2 but I think they’re fab! Also tell me if you have any favourite exfoliating pads or retinol treatments? I love hearing other peoples favourites!